Introduction: In previous articles i explained How to send emails in asp.net using Gmail and How to send emails in asp.net | How to set Smtp setting in web.config file to send email in asp.net and Send emails in asp.net using Gmail | How to set Smtp setting in web.config file to send emails in asp.net using Gmail in asp.net and Delete multiple records from asp.net gridview with checkbox selection and Show tool tip message using CSS and HTML and Highlight gridview row on mouse over using CSS and How to get CheckBoxList selected items in comma separated format in asp.net(C#,VB) and Fill CheckBoxList based on DropDownList selection in asp.net(C#, VB). In this article I am going to explain with example How to send mail to multiple users based on CheckBox selection inside GridView. I have also implemented the Select/Unselect all CheckBoxes inside GridView in this article. Implementation: Let;s create a sample application to see it in action. Note: Replace the Data Source and the Initial Catalog(i.e. 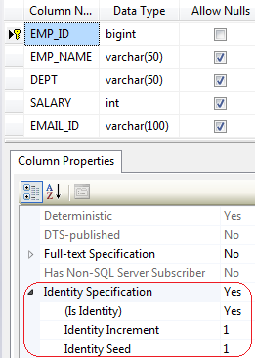 Database Name) as per your application. <asp:GridView ID="grEmp" runat="server" AllowPaging="True" AutoGenerateColumns="False"
OnCheckedChanged="chkSelectAll_CheckedChanged"/>Send Mail To All ? message.Subject = "Write your email subject here"
message.Body = "write the content of the email here"
very nice article...thank you and keep posting..
Sir..can you please send a complete tutorial starting from basic for WCF..
stay tuned and stay connected for more updates..
Error occured: The multi-part identifier "email id where sending email" could not be bound. Hello Ankit..i think your are missing something i n your code..so i suggest you to recheck your code and try once more..if still you face error then let me know..i will help you to sort out the error..
check and match for the sql queries with this articles too..
Hello Anand Bajpai..what problem your are facing? Please mentioned the exact error/exception that your are facing? Hello Arjun Walmiki..please check your email address format..if still you are facing problem then let me know..i will help you..
Where can i compose the message to send in their Email?